Where can I contact Service Desk? Goodnight friend, please Where can I get in touch? with Service Desk? The seller is not offering support or repair of the code. In the event of disputes that can not be settled directly between Buyer and Seller , either party may request the administration of mql5.com through the Service Desk on the User's profile. 12.1. Detailed requirements and terms of purchases and payments in the MQL5 Services are described in the corresponding Rules, Additional Terms and Additional Contracts. 12.2. To make purchases on MQL5 Services, you must have a valid Payment Account in a separate agreement with a Payment Processor. All financial transactions on www.mql5.com must be performed in accordance with the MQL5 Community Payment System Regulations. published at https://www.mql5.com/en/articles/302. Please read these materials carefully before you make purchases on MQL5 Services. 12.4. Prices for MQL5 Services will be expressed in US dollars. MQL5 Services may display prices to Users in their native currency, but they will not be responsible for the accuracy of exchange or conversion rates. 12.5. In performing financial transactions on MQL5 Services, you are responsible for paying all applicable taxes, fees and customs duties related to financial transactions in the MQL5 Services, including any related penalty or interest. 12.6. You agree to comply with all applicable tax laws, including the reporting and payment of any taxes arising from your use of the www.mql5.com website and the MQL5 Services. You will be responsible for non-compliance with any applicable tax law. Contact the technical support or the web site administrator. Here you can write your messages and see the history of your requests even if you are not registered on the web site. All messages are private and available only to you. In case of any fraudulent activities and/or misleading Product description, the Seller's account will be blocked and funds received from the Product sales will be returned to the buyers. In case disputes arise that cannot be resolved directly between the Buyer and the Seller, either party may apply to the administration of the mql5.com through Service Desk in the User profile. So, you should contact with the seller first. with the purchase of the product. Click on your profile. It's listed on the left had side of the page. If the seller publicly promissed that his tool will be profitable for you while you are losing money with this tool so - yes, the seller did mistake and you can ask for refund. But if you just bought the tool and this tool is not profitable - it is not for refund. important. I am very grateful! and this has not happened. is returning my dispute requests. The service desk follows the rules (look at the post #2) - and it is what I know in this case. Good luck. 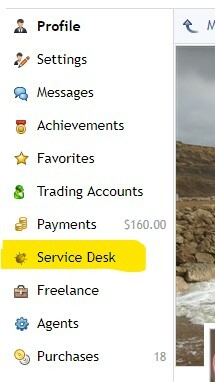 I am having problems with Service Desk. I was sold a faulty product which has since been withdrawn from sale. The Programmer has been fine and said I could receive a refund, but it wasn't granted. I've been told by service Desk to wait for it to be fixed but have no idea if/when that might happen? It seems very unfair to me. I did recently start a Forum Post of my own, but guess what; they immediately took it down! I asked them where else in the market place are you sold a faulty product and can't get your money back?